Take this self-guided tour developed by the American Institute of Architects Savannah Chapter right on your phone. Download the free app to access the GPS-led audio tour. The tour celebrates the contribution of local architects to Savannah’s Historic District a National Historic Landmark, designated in 1966, one of the largest in the country. 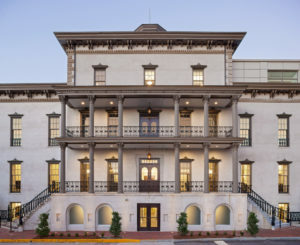 Local architecture firms’ award-winning restoration projects, such as the Savannah Law School (pictured above), are featured alongside contemporary residential buildings that stand in harmony with their historic neighbors in the city’s colonial-era squares. Also included in the tour are civic and government projects that introduced new architectural styles with buildings in the International and Modernist styles, from the 1970s to 1990s.